Follow these steps to publish your app in the Amazon Appstore. After you complete all the required information for a tab, the Developer Portal displays a green checkmark for that tab. You will not be able to submit your app until all six tabs show green checkmarks. Note: As you navigate from tab to tab, click Save to save your information. The information on each tab is not automatically saved when you go to another tab. For a broader overview of the app submission process, see Understanding Amazon Appstore Submission. 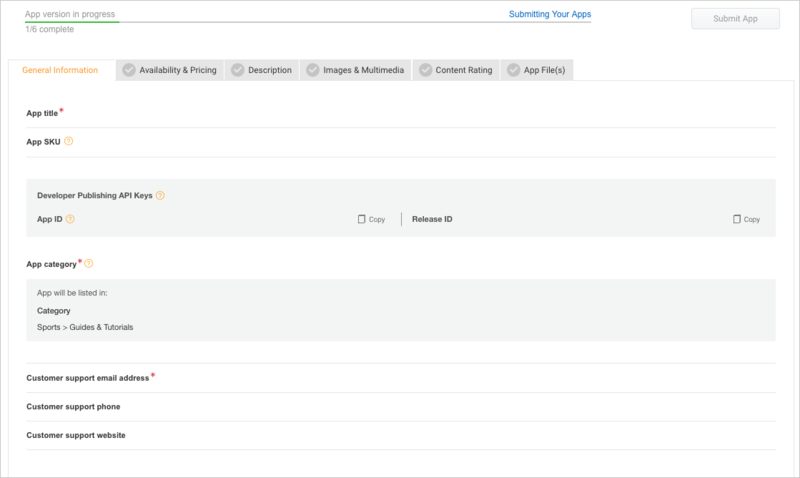 In-app purchasing: If your app contains items available for in-app purchases (IAP), you must enter those on the In-App Items tab before submitting your app. See Submitting IAP Items for instructions. Security Profile: If your app uses Login with Amazon, or Amazon Device Messaging APIs, be prepared to associate your app with a security profile as part of the submission process. See Associate Your App with a Security Profile. To get started in publishing your app, go to the first step: Step 1: Log In and Add an App.